Add all the cut veggies into mixing bowl. For better taste cut veggies into very small pieces. Add salt, haldi and pepper powder to veggies and mix well. Now break down eggs in separate bowl and beat well. Quantity of veggies depends on your taste. 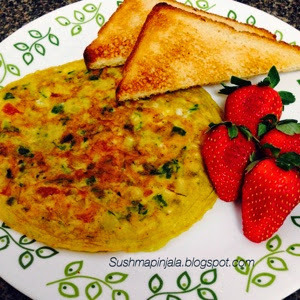 Now add veggies and fold properly so that veggies are mixed well into beaten eggs. Now add milk and mix it again. Heat skillet, add oil and spread all over the pan. 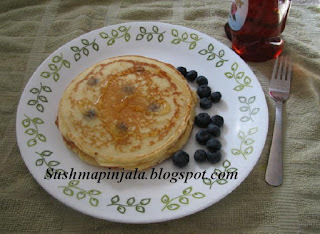 Add eggs and milk to pan cake mix. Heat pan and add little butter to melt. Now add 1/4 cup of mixed pan cake mixture on to the pan. After 30 seconds flip over and cook for another 30 to 40 seconds. Check to see what my fellow bloggers are cooking for BM 25. Today we are starting with 4th weeks theme "Breakfast on the run ". 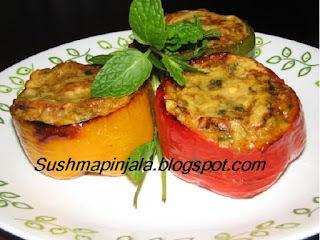 Today's recipe is very simple yet healthy dish. Beat eggs in a mixing bowl add milk and salt to taste. Now add egg mixture and black pepper powder. Mix well and cook on low flame. Add cheese if u like to. Toast bread on pan or toaster. 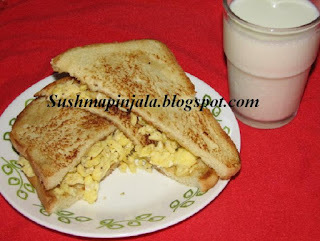 Spread the cooked scrambled egg mixture on toasted bread and top it with another bread. Serve hot or warm with a cup of milk. 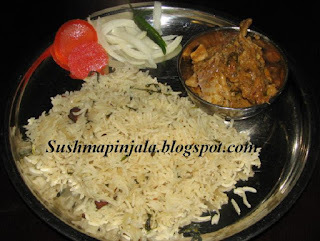 Shahi Pulao is one of the simplest pulao to be made. Can be served with any veg or non veg gravy curry. Heat pan add oil , jeera and shah jeera. Now add cinnamon, cloves, cardamom, bay leaf and green chilies. Now add chopped mint and cilantro leaves. Mix well and add soaked rice without water. Fry for few minutes and add 3 1/2 cups water. Cook on low flame will done. Garnish with chopped mint and cilantro. 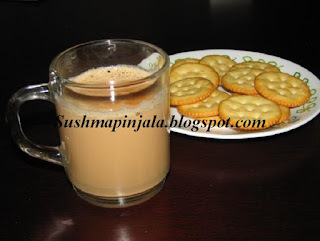 Ginger and cinnamon tea is perfect for the winter season. Specially to the one who is suffering with cold, cough, flu and sore throat. A healthy drink that's great for digestion and nausea. Add tea powder, grated ginger, sugar and cinnamom powder to boiling water. Boil for 5 minutes on medium flame. Garnish with thinly sliced ginger on top. Add ajwain and salt to flour. Now add melted butter and mix well. Using water little at a time make the flour into soft dough. Cover it and let it rest for 30minutes. Now knead the dough for 4 to 5 minutes and divide it into 6 equal portions. Now roll each dough ball into big circle like chapati. Using knife cut it into long strips or as diamond shape. Drop each strip or piece into oil slowly. 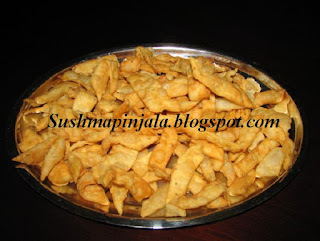 Fry till golden brown on medium flame. Remove and let them cool to serve. When completely cooled store in air tight container. Add sugar, eggs and half the milk to flour and mix well. Slowly add rest of the milk to make a smooth batter. Heat pan / skittet and melt little butter. 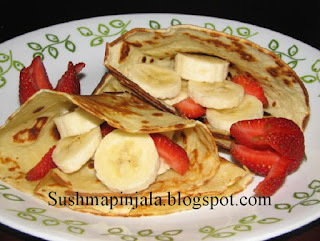 Now pour quarter of the batter and spread it all over to amke thin crepe. Cook for 1 to 2 minutes on low flame and flip over to cook on other side. Today's recipe is from the same cook book" Indian Home cooking" . It was difficult for me to choose what to cook for today because this book has lots of veg and non veg recipes. Finally I wanted to cook something which I never tried. Bought some fresh bell peppers from farmers market today and tried Bharwaan Mirchi which is a stuffed bell pepper recipe. It was soo simple to cook and also colorful as I used 3 different colored peppers. Boil the potatos in presser cooker. Let them cool, peel off skin and mash it. Meanwhile cut around the stems of bell pepper, removing about 2 inch round from the top od each bell pepper pull out and discard these tops. We are starting 25th Edition of Blogging Marathon today. Its been awesome doing different themes for each marathon. I have been part of BM since its 5th edition. I wonder how Srivalli comes up with such a wonderful themes. It was more fun seeing and learning new and different recipes from all the lovely bloggers. My theme for the 1st week of Bm 25 is Cooking from a Cook Book. I bought the book "Indian home Cooking" by Suvir Saran and Stephanie Iyness from the local library. It had variety of recipes from soups to sweets. 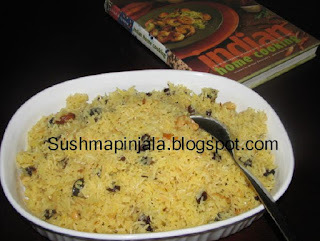 For today I choose a different rice recipe which is called Zarda Pulao. This simi sweet dish has lots of nuts and flavored with saffron. Any gravy curry goes well with this.